For ages, I've had my eye on this Dorie recipe because the picture in the book just looked so damned good. I very nearly chose this when it was my turn to pick back in June but the hubby overruled the choice so I'm so glad that all us TWDers finally get to try this one out! Given that there are just 2 mouths to feed in our household and that I didn't want to bring a half-eaten cake in to work, I decided to half the recipe and bake my cake in a 6" pan. Thinking that a smaller cake would probably need less cooking time, I baked my cake for about 35 minutes and on hindsight, wish I had taken it out 5 minutes earlier. The cake wasn't exactly dry but it wasn't quite as fudgey as I hoped it would be given its name. In case you haven't guessed, I'm definitely in the fudgey camp when it comes to the fudgey vs cakey brownie debate. I didn't have any problems with the caramel except when it came to putting it on top of the cake. As you can see from my picture, the caramel started dripping down the side of the cake because I didn't leave the cake in the pan when I was putting the topping on. Still, I think that the drips almost make the cake more enticingly yummy and it sure didn't hurt the flavour! The cake tastes like a variation on a Snickers bar, so if you're a peanut lover, definitely try this. I think it looks great with the dripping caramel. I made the same mistake! I love the dripping caramel look - very chic! ;) This cake was fabulous! Yours came out looking just like the book! Beautiful! The caramel drips were my favorite part of how this looks, so I love how yours looks. Nice. looks very enticing to me! Your cake looks great, I love the colour of your caramel: perfectly amber! The cake, especially the drips, looks amazing! Great looking cake! Mine was a bit on the dry side too. It looks great! I think the dripping caramel looks fabulous! And, I too, am a fudgey brownie person! Oh wow your cake is beautiful! The dripping caramel looks awesome. I've seen a few blogs not terribly impressed with the cake but the finished product looks just wonderful. The Ina chocolate cake with this topping would be out of control. 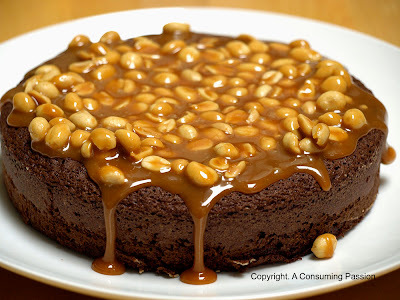 This looks great- I love the dripping caramel. I was a bit surprised by the texture of the brownie cake too- I expected it to be more fudgy. It looks delicious. My cake pulled away from the sides of the pan while it was baking, so even though I put it back in the pan to put the topping on, it dripped down the sides. Not a bad look though. Yours looks great! I also made a 6-inch cake and baked it too long. Love your caramel drips! Oooh. I'm not a huuuge brownie person, but when you said it tastes like a Snickers, that sold me! I think the caramel looks soo pretty. I can´t resist chcolate and i love the dripping caramel look! It makes me wanna take a big pice of that lovely cake! Your caramel looks perfect! I agree that the drips make it look even yummier! I'm a huge fan of your blog and your photos. Just wanted to let you know I linked you!